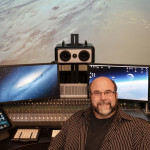 Pictured in his Formosa Group post-production studio is Supervising Sound Editor / Sound Designer Scott Gershin. Photo by David Goggin. 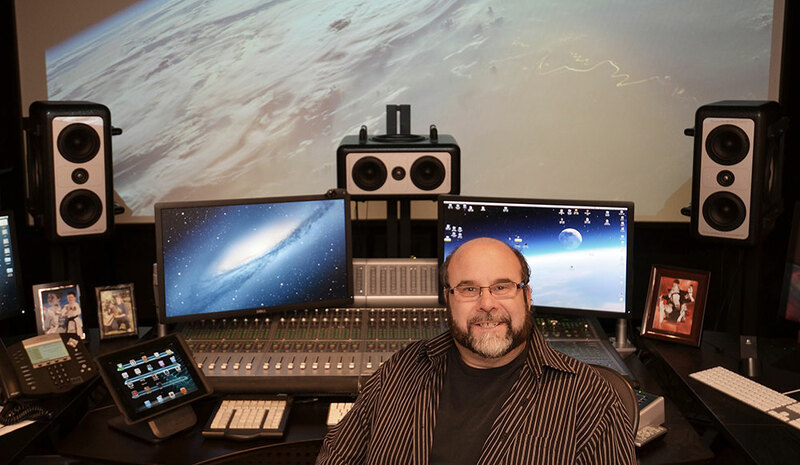 As a veteran supervising sound editor and sound designer, Scott Gershin equates the sound elements of a film to those of an orchestra. 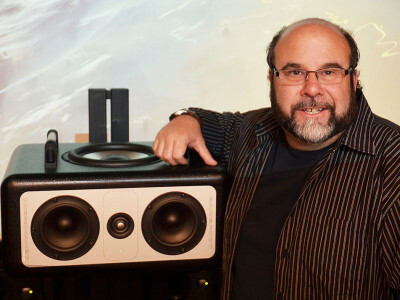 He builds a sonic tapestry, blending sounds to create emotion and clarity. Gershin is a graduate of the Berklee School of Music in Boston. Previous to joining Formosa Group, he worked at Soundelux as a Sound Supervisor and Sound Designer, as well as the Founder & Executive Creative Director of Soundelux Design Music Group. His resume includes over 100 films. Gershin has received ten MPSE Golden Reel Awards out of twenty-eight nominations. He is also an Emmy and BAFTA nominee. Barefoot: We’re here at the Formosa Group today with Scott Gershin. Let’s talk about the Barefoot Sound monitors that you’re using in your room here. Shall we start with how you found out about Barefoot? 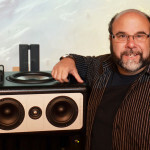 Gershin: When I decided that I wanted to get another set of speakers, because I use multiple speakers, I started looking around to find out what was available. I wanted to start with a clean slate. I started looking at the possibilities. There were definitely speaker manufacturers that I knew about, but there were other manufacturers that I wasn’t familiar with. I wanted to investigate all the different manufacturers, and especially the boutique speaker manufacturers. Then I started one by one finding out where I could listen to them, and if I could get them brought to my studio so I that I could hear them in my environment. I went to Vintage King and brought material that I’ve mixed, and started going through the different sets of speakers. I listened to my work through a lot of speakers, almost 20 different brands. I had a price range in mind, but I didn’t mind if there was a great set of speakers that were cheaper. It was an open field, and I had done a tremendous amount of research online. However, you can only do so much research online, and then eventually you’ve just got to listen. I narrowed my selection down to a short list and after a lot of listening ended up going with Barefoot. Barefoot: What kind of material were you listening to; to determine what monitor you wanted to go with? Gershin: I used two types. I listened to the material that I had mixed in the video game world. Then I also listened to work that I had supervised and designed in the film world. I brought in lots of different projects. There was one great project that we had done, and it had these great octave drops. It would be octave dropping to the low end. That was very insightful because it was amazing when I played that material through a variety of speakers, how each speaker responded to it. A lot of them couldn’t reproduce it, so all of the sudden that was very revealing. I think the difference in my need for speakers, compared to maybe someone just doing records, is that the low-end is very important. I’m dealing with a lot of full-range speakers in theatres, and I need to be able to hear the low-end. A lot of people want to hear low-end to get rid of it. I need to hear the low-end to make it translate correctly, to make it punchier. The low-end component in a film or game mix is very important. A lot of times, I’m working in 2.1, 5.1, 7.1 or Atmos. I needed to be able to hear how they would respond to a full range of material that was non-fundamental based; basically noise. It’s amazing how some speakers I found very musical, but when I started putting a lot of non musical elements into them they reacted differently. Also, how much punch do they have, how does the punch translate to other speakers, how much transient response do they have, especially in the high end information, then also, how do they translate in a theatre or a home system. A lot of people want to hear low-end to get rid of it. I need to hear the low-end to make it translate correctly, to make it punchier. There were many speakers that I thought — oh my God, these are amazing-sounding — but they don’t translate well. Also, the spoken word, dialogue, how does that sound? Am I hyped a little bit? Do I have a little bit of a smiley face going on? Are the highs really having a shine to them? Do the lows have too much on them? I was trying to find something that was familiar to my ears. Barefoots, for me, fit what I was looking for. Barefoot: I’ve heard some people who like using Barefoots say that they’re brutally honest with the sound, there’s no coloration, they’re not screwing around, you’re getting the honest sound of the work that you’ve done. Does that equate with what you’re talking about? Gershin: Yes. The clarity is definitely there. I put up a lot of mixes that I had done previously. Some mixes sounded great, which confirmed that they were good mixes. Other ones, I would hear little things that I might have overlooked. The other plus for these speakers, which is not why I bought them, but boy is it nice to have those four different profiles on the speaker that emulate theoretically a super-high end Aurotone tone, an NS-10, and what they call flat and then hi-fi. I’ve been talking to Barefoot about creating one with a modified X-curve that is a little more theatre-like, having the high-end rolled off a little bit. I would like to note that there is a big difference between a horned speaker behind a screen and a nearfield tweeter. In a “smaller room” I am able to work out the translation with these speakers. A modified X-curve is pretty much what all theatres are tuned to. It’s a little bit of a roll-off on the high-end because they’re dealing with such a large auditorium. Anybody that plays back in large auditoriums uses an X-curve. Some X-curves can be pretty extreme, so a lot of them in this day and age more recently have been going with something called a modified X-curve. It’s a little less drastic. I liked the hi-fi setting, which I wasn’t sure I would use that much, because it has a slight de-focus to the speaker, it’s a little less articulate and precise, in such that it sounds more like other speakers that I’m used to hearing. I find that when I go to the flat mode, yeah, I hear everything, but I hear everything in a way that is not hyped, that it doesn’t have that little shine and shimmer like certain speakers do. The Barefoots are very flat and natural, especially when I compare them to other speakers when I’m working. I’ve got a custom switch that was built for me that allows me to literally switch between different fronts. I have multiple LCRs in my room, and then the surrounds are always the same. That allows me, fascinatingly enough, to hear the differences between the speakers. Sometimes, they’re not subtle. I find that if I can get both speakers to sound good, then I’m in the zone. Barefoot: I see the setup in your room here; you have three of the Micro Main 27s in pretty close proximity to the mixing spot in your console. Gershin: I’ve heard some people recommend three to four feet, but that doesn’t make sense to me because I need more air. I’ve got them five, six feet out. Barefoot: Have you completed a mix using the Barefoots, and then gone into the theatre and heard the results? Gershin: Yes, a little bit. I’m in the midst of mixing right now so I’ll soon hear it in a major way. When I was taking material back and forth, it seemed to translate. I haven’t had them that long. So far, what I’m seeing is they’re quite nice. It allows me to hear a lot of detail, and that’s one of the things that I liked. There are different philosophies. I’ve done what might be considered a “classical” approach in that I use a speaker that’s not very good sounding — the lowest common denominator — and I mix to it, and it represents what people hear, and if I can make it sound great on that, I know I’ve got something going because it sounded good on everything else. I’ve done that for most of my career. Here’s the most important thing; I love sound. I really love good, full range, dynamic sound. It stimulates the synoptic part of my brain, the pleasure centers, when I hear good quality audio, it makes me, well, “happy”. I decided what I wanted was something that not only translated, but also something that sounded good, where I would go — yeah, I love that. 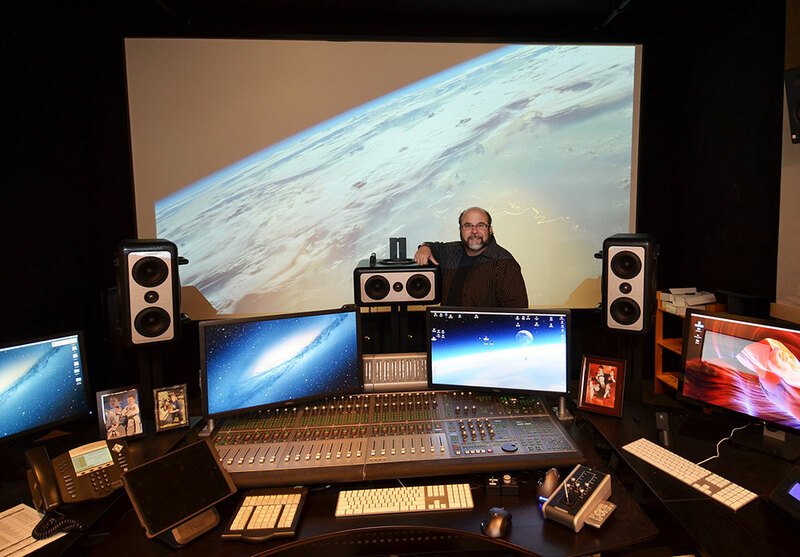 You go to a great home theatre, and you hear your mixes, and you go, wow, that sounds great. Many big theatres don’t sound very good. 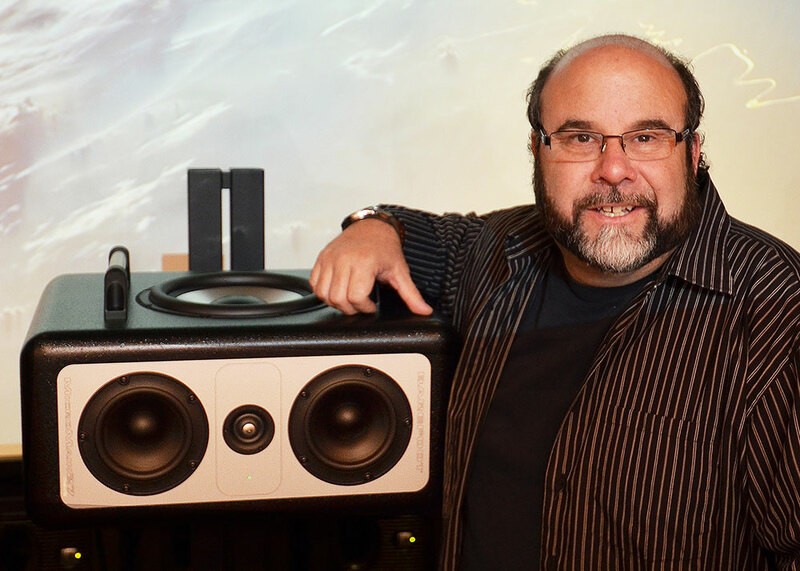 They’re loud, and they’re big in their subs, but the fidelity, the imaging, the depth of field — you don’t hear any of it in a big theatre because you’re in a big room with all the acoustical issues and you’ve got a big sheet of perforated fabric in front of the speakers. The speaker system is a horned system, which has its own set of issues. They’re meant to cover distance. Also, not all horn components are the same. When you go to a nice home theater, and you hear it, and you go wow, I’m hearing things I’ve never heard before, this is great. Then I thought, wait a minute, how about I change this up? 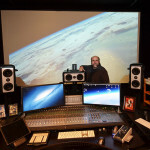 How about I build a really nice home theatre in my studio, so my clients and I get to experience their project that way. It’s important the room translate when it goes into theatre, it can’t be drastically different. I understand some of the detail may not be there. A lot of our projects, I hate to say, have a longer life in your home than they do in the movie theatre. That’s where it stands the test of time. I’m trying to build my design, my mixes, my entire creation while listening in all the various environments they will eventually be heard. You only get to audition your sounds once. I want my clients to have the best experience “the first time” they hear it. It makes our lives easier and more enjoyable, as long as it translates. Barefoot: Could you mention a few projects that you have used the Barefoots on or that you’re planning to use? Gershin: Again, these are pretty new, but I’m doing a project now called “My All-American.” It’s not out yet. When testing the Barefoots, I used them a little bit on “Nightcrawler” and “The Book of Life.” I was able to listen to that material through them. Also, when I was auditioning these speakers, as well as others, I brought all my friends in. I brought lots of other ears in. A lot of times, you can focus on a specific sound or specific element of a mix, and somebody might focus on something different. Again, there are a lot of very great speakers out there. For me, I kept going back to the Barefoots, and then I wasn’t sure if it was just me. The interesting part was that for everybody I brought in it was unanimous. Everybody kept going back to the Barefoots. The interesting part was that for everybody I brought in it was unanimous. Everybody kept going back to the Barefoots. I love the bigger ones, too, the MM12s. They’re just amazing. That was my first choice but they were a little out of my price range. If you want to have a great listening experience, they’re pretty fantastic. I found the MM27s to be something that A, fit my budget and my room, and B, would get the job done. Barefoot: You have your Barefoots freestanding, and about five to six feet from your mixing spot. Gershin: Five, six feet. I’ve tilted them in a little bit. I usually don’t. I usually tilt them out, but when I’m doing stereo mixes I want to hear the imaging. What’s interesting, and I’ve had a lot of conversations with acousticians as well as speaker manufacturers about this, is with the concept of an LCR configuration, where is the best place for it to be? The problem is that when you get a great phantom center, in the theater, there is no phantom center because the screen is so wide. They need that center speaker. Having a slight hole between your left and right, sometimes isn’t a bad thing, because that’s what the center speaker is for, to fill that hole. I go back and forth with the speakers in regards to how I have them tilted. Right now, I’ve got them in for a phantom center, but sometimes, I tilt them out because I want to get a wider field. It’s a slightly different experience, but they hold up both ways. These Sound Anchor stands I got from Vintage King are great. Between the speakers and the stands it’s probably over 150 pounds. They’re really heavy. I don’t like metal stands for the obvious reasons. They ring, and yada-yada…. I don’t know if these are sand-filled. My guess is they are filled with something because there’s no resonance and they’re really heavy. To set them up, it takes two people. It was quite the task with the speakers on them. To move these around is an interesting dance. Barefoot: You’ve got to satisfy a lot of different kinds of projects, as well as a lot of different listening environments. Gershin: Yes, that’s the name of the game, and Barefoot works for me.